Every month my company Chronolytics sends out a newsletter to the watch industry, watch enthusiasts and press with some facts & figures on watch consumers and their ‘behavior’. Today’s newsletter is about the awareness of German watch brands by consumers from the USA. Based on IP-address and cookies, Chronolytics is able to track the on-line behavior of millions of watch enthusiasts on the largest watch market platform in the world. I thought it would be interesting to show how German watch brands are doing in the USA, as some of them are clearly trying (and with quite some positive results) to get a piece of the US market for (luxury) watches. This article is an excerpt of the original newsletter that was sent today by Chronolytics (to which you can subscribe here). We selected 51 German watch brands from our database (of 500 different watch brands in total) and analysed how many people from the USA have been showing interest in these brands in Q2 2013. Based on +70.000 unique visits from the USA to watch classifieds of these 51 German brands, we came up with an interesting overview with a number of surprises (see below). We also measured the increase or decrease in the share of interest in these brands compared to Q1 2013. We only measured the relative growth, this means we do not take the increase of the number of visitors to our data source into account. Interesting to see is that A. Lange & Söhne has a great brand awareness amongst US watch enthusiasts and it showed a relative growth of 20,71%, from a share of voice of 21,54% in Q1 2013 to 26% in Q2 2013. The number 10 of this list, Tutima – who introduced an interesting line-up of watches this year in Basel, including their re-launch of the renowned military watches – showed an increase of 12,74% compared to the previous quarter. In total, the Top 10 German watch brands listed in this overview are good for a share of voice of 88,81% of the list of 51 German brands. The brand in this Top 10 with the highest relative growth is MeisterSinger. Of the Top 10 German watch brands in the USA, 4 brands encountered a decrease of their share of voice in Q2 2013 compared to the first quarter. Also interesting to note is that 57% of all queries for German watch brands in the USA relate to new watches. Only 2% relate to watches with quartz movements, 60% to those with automatic movements and 38% to watches with hand-wound movements. The Top 10 list also mentions Chronoswiss, a brand founded in 1983 by Gerd R. Lang in Munich, Germany. Although the Swiss Ebstein-family bought the company in 2012 from Gerd R. Lang and relocated its management to Lucerne, we still included Chronoswiss into this list due to its German roots. 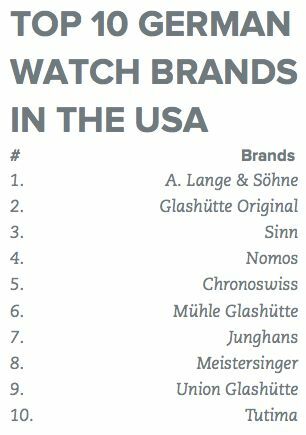 In any case, Chronoswiss seems to have a lot of awareness amongst watch consumers in the USA with their rank #5 in our overview. Almost 10% of all +70.000 queries in Q2 2013 for German watch brands were for Chronoswiss watches. 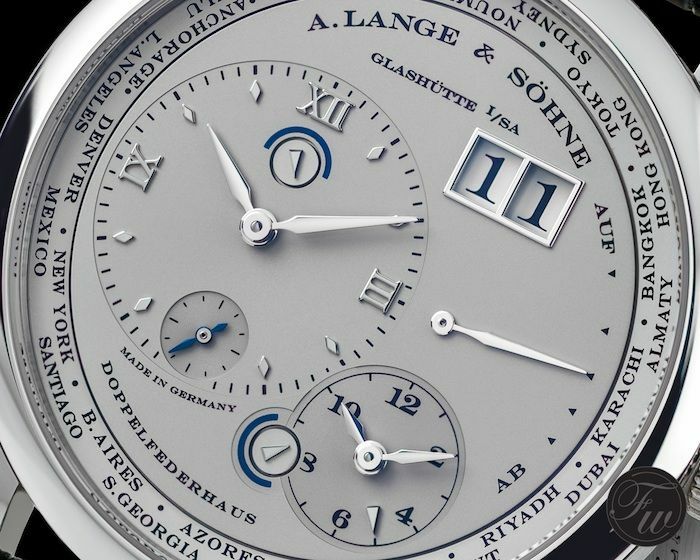 The photo of the A. Lange & Söhne Lange 1 Timezone in platinum is of our soon to appear review on this watch.